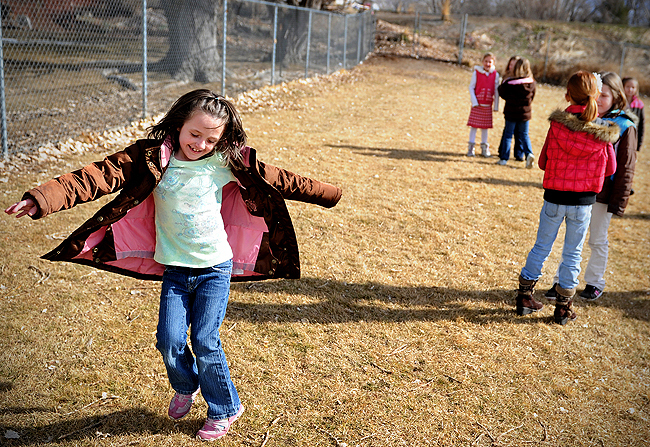 "Second-grader Emily Heaps, 8, plays a game on the playground with friends at Sego Lily Elementary School in Lehi, Wednesday, Feb.3, 2010. Emily, who had Severe Combined Immunodeficiency Syndrome, had a bone marrow transplant almost a year and a half ago that was supposed to help. She is now able to interact with peers and go back to school." Last week I was told I'd be going to hang out with a bubble boy..err...bubble girl. I wasn't sure what that meant, but remember seeing the Jake Gyllenhaal movie, cleverly titled "Bubble Boy" many years ago. But when I got more information, I realized my subject was thriving, living life to the fullest now. Emily Heaps, 8, has severe combined immunodeficiency syndrome, which is a genetic defect that destroys the body's natural immune system. It's nicknamed "bubble boy disease," after a 12-year-old boy who lived in a plastic bubble to keep him away from all germs. From what I understand, it's more common in boys than girls, and Emily's mutation is the least common, and hardest to treat, of all. In August 2008, Emily had her second bone marrow transplant; the first happened when she was just two months old. In the months after that second surgery, Emily's doctors have looked at her low white blood cell counts and worried the surgery didn't work. But as I saw her on the playground, she is now happy, energetic, and healthy and also now thriving in a public school. She is able to play sports and interact with her friends at recess and has no problem believing the treatment was successful. A year ago, as Emily sat out first-grade because being around other people, especially children, was too dangerous for her fragile body, her family and doctors were waiting to see if the second transplant had been successful. But now all is well, she healthy as she's ever been. It was a pleasure hanging out with her, and well, her 20 some screaming, hyper classmates. I was worn out after chasing them around the playground for 30 minutes! I hope she continues to beat the odds.